If you've ever wondered to yourself "Why keep a food journal?" you might be in for a surprise. Many people can attest to the fact that this one simple task can make a world of difference when it comes to your weight loss efforts. Many diet and weight loss programs tout the benefits of keeping a food journal. Food journaling is a simple and private way to keep yourself accountable and to gauge your good and bad habits. There are a couple of different ways to use a food journal, and both can be quite effective. Some individuals use a food journal to log their current eating plan so they can help themselves or a nutritional professional determine what changes might be necessary to make in the diet in order to reach certain health goals. Follow these tips to make the most out of your food journal experience. Log everything. This might seem obvious, but many people who choose to keep a food log, especially one they plan to share with a health professional, skip the small things. Be sure to log every single food or drink you consume, from that no-calorie diet soda to that tootsie roll you grabbed out of the company candy dish. These things add up. Note the time. It's often helpful to log the time of day you consume a meal or snack. This can help you determine times that tend to be your danger zones. Are you a night eater? Do you tend to snack after lunch? These are the kinds of questions that can set you on the right path to answers and to a healthier way of life. Measure your portions. Make sure you're writing down the correct portion sizes. Don't assume what you get at a restaurant is a single portion. Instead, be specific. Log "six-ounce steak" in place of a simple "steak." Some studies suggest it's much harder to overeat or "graze" throughout the day if you are writing down your meals and snacks. Here are a few other reasons why many people use food journaling as a preventative means to live a healthier lifestyle. Pre-Planning - Many diet programs that encourage the use of food journals suggest pre-planning as a strategy for losing weight. Some individuals find it easier to eat well when they are following a plan. It takes the guess work out of making lunch choices on the run, or trying to figure out breakfast on a busy morning. Portion Distortion - Keeping a food journal, especially if you are using an online calorie-counting version, allows you to see how many calories you take in with each portion of your chosen foods. For example, many people tend to eat two or even three servings of cereal in the morning. This doubles or triples the amount of calories you are consuming, and this is something you'll want to note in your food journal. Food History - Keeping a record of your food consumption can be a real asset when it comes to trying to figure out the whys of weight gain and loss. If you did very well one month, but poorly the next, you may be able to figure out the reason just by going over your food journal. Why keep a food journal? Why not? 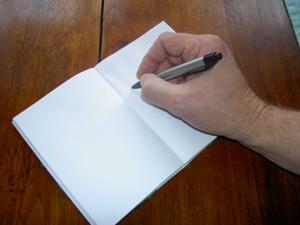 Journaling is a simple way to check your eating habits are healthy and to help you stay on track. One of the best facets of a journal is it costs only the price of pen and paper. Additionally, there are a number of online calorie-tracking journals that make figuring out the caloric value of a meal or food a cinch. These websites often offer a free membership. Many of these programs come with the added value of community forums, interesting and helpful articles, exercise logs, and online groups support.